IOGO lemon lime greek yogurt: a hit or a miss? My daughter loves all things lemon and lime. Water with lemon? Check! Water with lime? Check! Lemon sorbet? Check! Plain ol’ lemon? Check! Plain ol’ lime? Check (she took a bite out of a lime wedge at a restaurant yesterday, then shivered at how sour it was, but it didn’t seem to faze her one bit!). IOGO lemon lime greek yogurt? That I’m not so sure about. Product Review: What ingredients are in the IOGO lemon lime Greek yogurt? 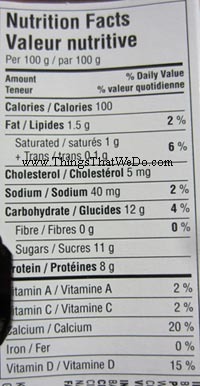 Before we talk about our taste test, let’s take a look at what the IOGO lemon lime Greek yogurt is made with. Here is a list of ingredients that went into the IOGO lemon lime Greek yogurt: skim milk, cream, active bacterial culture, vitamin D3. The lemon lime preparation is made with: cane sugar, lemon pulp and juice, water, honey, lime juice, natural flavours and colours, pectin. Okay, if the IOGO lemon lime Greek yogurt already has real lime juice and lemon pulp and juice, does it seriously need any natural flavours or colours to be added on top of all that? That’s just silly. Overall, the IOGO lemon lime Greek yogurt is made with choice ingredients that are simple and basic. Real honey, not something with ‘ose’ this or ‘ose’ that. That’s impressive. Product Review: So, is the IOGO lemon lime Greek yogurt any good? I tasted the IOGO lemon lime Greek yogurt and so did my daughter and when she first tried it, she liked it. The pack of IOGO lemon lime Greek yogurt that I purchased came with 4 individual containers, each 100 grams. She happily ate her container of IOGO lemon lime Greek yogurt and said it was yummy. 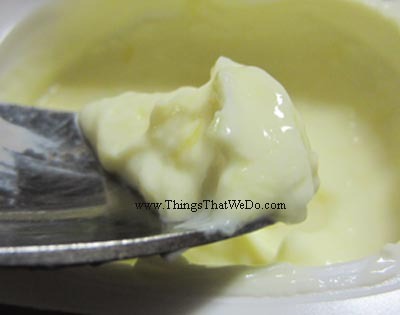 The IOGO lemon lime Greek yogurt is thick, it’s rich, and it’s definitely got the lemon lime kick to it. My daughter also mentioned that it tasted very similar to another yogurt that we tested in the past and she’s right. So, is the IOGO lemon lime Greek yogurt any good? I’d say, yes, if you like lemon or lime. It tastes as it should. Does my big kid actually like the IOGO lemon lime Greek yogurt? I’m not so sure. Reason: when my kid likes something, she’ll ask for it, often for days on end. Case in point: she’s recently re-discovered a love of marble cheese and has asked me to buy it almost daily. Another example: when we picked up that other brand of yogurt, she’d ask to eat it daily until we ran out. She went through a cottage cheese faze and did the same thing. It’s been a good 2 weeks since we first tested the IOGO lemon lime Greek yogurt and the other 3 containers are still in our fridge. Ask her if she likes it and she’ll say ‘yes’. Ask her if she wants to eat it and she’ll say “not really” or “not right now”. My speculation: either she’s not into yogurt right now or she’s just not that into the IOGO lemon lime Greek yogurt. 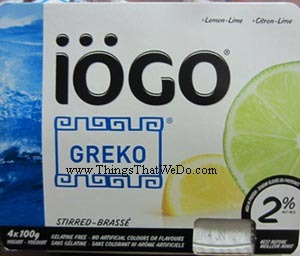 I personally liked the IOGO lemon lime Greek yogurt. 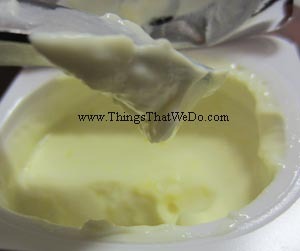 It was rich and creamy and definitely looks and tastes like a thick rich Greek yogurt. I do think it’s unnecessarily yellow though thanks to the use of natural colours. That threw me off a little bit. Add a tad more yellow and that IOGO lemon lime Greek yogurt might as well be radioactive! Would I buy the IOGO lemon lime Greek yogurt again? Probably not. Unless my kid absolutely begged me to buy the IOGO lemon lime Greek yogurt, I might consider picking it up but it’d have to be on sale. I have an existing list of yogurts that I already prefer and while I liked the IOGO lemon lime Greek yogurt, it doesn’t make my top 10 list so there’s no pressing urge to buy it. Am I being too harsh on the IOGO lemon lime Greek yogurt? I don’t think so. I’ve stalled this post for a good 2 weeks just to see if my kid would pick up the desire to eat it again and she hasn’t. What can I say? The evidence lies in those 3 leftover containers that are still in my fridge!